Whatever breaks they may take, whatever line-up they may feature, you know that any Fear Factory release is an industrial metal one; with a more extreme approach or more mainstream-oriented, but industrial metal nevertheless. So you’re left with just one obvious question: is it good? This time it’s great! 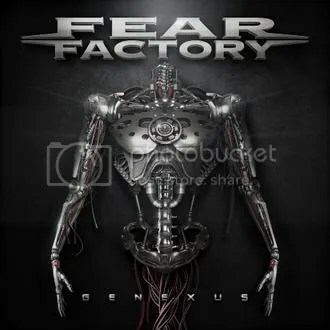 In the year that “Demanufacture” celebrates 20 years, Fear Factory pay tribute to it in the form of “Autonomous Combat System”, the opening track of this “Genexus”. The violent drumming and cranking riffing embedded with such regal electronics sound like a version 2.0 of something that could have been featured in that breakthrough album of theirs. I’m still wondering how this didn’t make it to single. The synths in “Anodized” are more vibrant and the chorus is more melodic, but it doesn’t make this track, as a whole, less heavy than its predecessor. On a second thought, when listening to “Dielectric”, I understand why this was the third single and not “Autonomous Combat System” – its eager intro and richer structure are somewhat more compelling. “Soul Hacker” – another single – has that nu metal vibe that earned them new fans during the “Digimortal” era. I’m already picturing a massive jumping crowd when played live. “Protomech” is probably my personal favorite, having a killer rhythm combined with classy synths – the proverbial neon sign that glows “FEAR FACTORY!” in your mind. The same can be said of the title-track, hence the “probably” in my previous sentence – although with a distinctive identity, the adjectives to describe both songs are similar and are exactly what I like the most about the band’s sound, becoming hard to say which one I prefer. But that’s a good thing, as it is proof of the creative quality of the album. “Church Of Execution” is yet another example of the more alternative vein of the band. Less sharp than “Soul Hacker”, but a lot groovier and catchier. Still, it’s “Regenerate” that represents the most melodic track. Of the regular aggressive songs, that is – the album finishes with a beautiful electronic ballad, “Expiration Date”. But before that there’s still room for one more straightforward electrical discharge that goes by the epic name of “Battle For Utopia”. In sum, “Genexus” gathers ten tracks that deliver a little bit of everything that the band’s done so far. And therefore I believe it will please both old-school and modern fans, as the general outcome stands in-between the aforementioned extreme and mainstream styles. This entry was posted on 3rd August 2015 at 12:14 am and is filed under CD, Industrial, Metal with tags Fear Factory, genexus, Industrial metal, new album, Nuclear Blast. You can follow any responses to this entry through the RSS 2.0 feed. You can leave a response, or trackback from your own site.